Quinn Dukes (AP '15) is featured in "User Error: A Night of Performance Art" at the Museum of Contemporary Art, Tucson this Friday, March 2. Quinn Dukes (AP '14) performs live tonight (4/13) in "KarnaL KriminaLz [fujeetiv fleshh]" at The Woods Cooperative in Ridgewood, Queens. Quinn Dukes (AP '15) participated in "Performance and Consumption" at the Queens Museum this past Saturday, December 17th from 2pm–5pm. 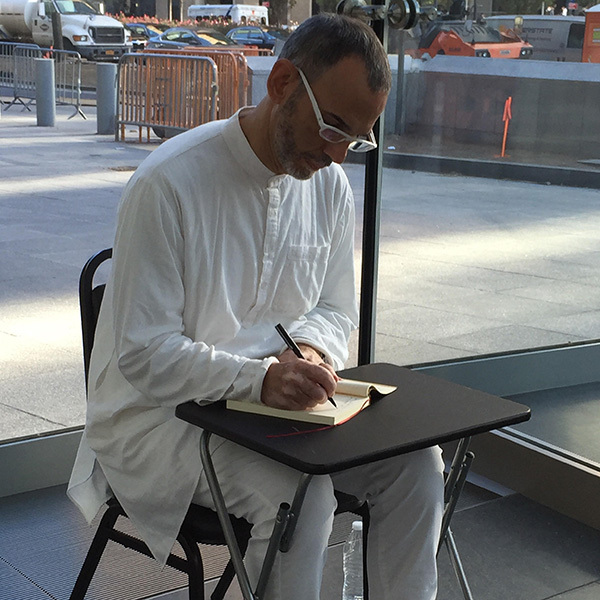 Ernesto Pujol (AP Faculty) in his performance, 9-5, earlier this week at Brookfield Place Pavilion. Pujol discusses the work with Quinn Dukes (MFA AP15) on her site Performance is Alive.